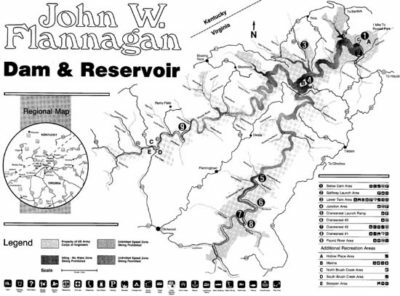 Flannagan Reservoir is a 1,143-acre impoundment located in Dickenson County. The reservoir was built to provide flood control, pollution abatement, fish and wildlife habitat, and recreational opportunities. The U.S. Army Corps of Engineers completed construction of the dam and project in 1964. The project was named for Ninth District Congressman John W. Flannagan. Fifty miles of beautiful shoreline consisting of mature hardwood forest interspersed with spectacular rock bluffs surround this deep, clear reservoir. At full pool elevation of 1396 feet above sea level, the lake has a maximum depth of 166 feet and an average depth of 58 feet. During the summer and fall the lake is incredibly clear, with visibility often exceeding 20 feet. The lake level fluctuates about 16 feet per year. The lake is drawn down to winter pool during October and November, and is typically returned to summer pool in April. Flannagan Reservoir is home to a variety of sportfish species including: largemouth and smallmouth bass, walleye, hybrid striped bass, channel catfish, flathead catfish, crappie, bluegill, rock bass, common carp and musky. Alewives and gizzard shad provide forage for the sportfish populations. Black bass populations (largemouth and smallmouth) are stable, and offer good numbers of fish in the 12 to 15-inch ranges with a good shot at a trophy. Smallmouths are more abundant along the rocky banks and bluffs in the lower reaches of the reservoir and in the Pound River arm of the lake. Largemouths seem to dominate the Cranesnest arm of the reservoir. Soft plastics, jigs and spinnerbaits are popular during the daytime. As you might expect with the ultra clear water, night fishing is very popular at Flannagan. At night, buzzbaits, top water plugs and jig-n-pigs are productive. Surface action can also be fantastic for a few hours at dawn in late summer. Walleye fishing success has declined at Flannagan since the fish kill in the fall of 2004. There are still decent numbers of walleye to be caught, but densities are much lower than they were from 2000 to 2004. Anglers will probably be pleased with the average size of walleyes landed this year, but might be disappointed with the numbers of fish caught. Flannagan is still a “Priority” walleye water, meaning that the lake receives the maximum number of walleye fingerlings per acre, and the lake is stocked every year. Hopefully these annual stockings will rebuild the population quickly. Spawning walleyes run into the Pound and Cranesnest Rivers during March. Some fish also spawn on rocky banks in the lower reaches of the reservoir. Anglers are able to entice some of these spawning fish with minnow plugs such as the Rapala. During April and May walleyes return to the reservoir and gather in feeding locations along the banks. Successful anglers fish at night, when walleyes are feeding on spawning alewives. Shallow running plugs and surface baits are most effective. June is a transition month, with some walleyes remaining shallow and others moving to deeper summer habitats. Deep running lures like the Spoonbill Rebel are a good choice. July, August and September find walleyes in 20 to 40 feet of water. Anglers are learning to catch these deeper fish by trolling night crawler harnesses or plugs on lead core line. Most Flannagan anglers take to the woods for deer hunting in fall and winter, but a few anglers have had good success catching walleyes on jigging spoons during the winter. Hybrid striped bass were first stocked into Flannagan Reservoir in 1999. These fast-growing, hard fighting fish are already providing some exciting angling. Hybrids stocked in 1999 now exceed 16 inches. The hybrid fishery is still relatively new at Flannagan, but several distinct seasonal patterns have emerged. Topwater lures are a good choice when alewives come shallow to spawn at night in April and May. Fishing with live alewives or other baits under floating lights at night is effective during the summer months. In late summer and early fall, anglers wait patiently in key locations for the opportunity to cast into surface “breaks”. Hybrids chase schools of shad to the surface where a frenzy of feeding results. Almost any lure that can be cast into a break will result in an immediate strike. These breaks are more common early and late in the day, but they can occur throughout the day, especially if rain or overcast conditions prevail. Hybrid striped bass are stocked into Flannagan each year. Crappie fishing has really improved in recent years. The Department began a multi-pronged approach to improve the crappie population in 1998. We began stocking adult crappie (average size of six inches) to bolster the spawning population. A minimum size limit of 10 inches was established on January 1, 1999. Finally, fisheries biologists have worked with local volunteers and the Corps of Engineers to enhance crappie habitat. To date, more than 75 hinge-trees and hardwood brush shelters have been established. Crappie fishing is very good in the Pound and Cranesnest River arms during the early spring months. Crappie congregate on submerged trees and other brush and can be caught on live minnows or jigs in the daytime. During the summer months anglers have good success fishing at night under floating lights. Live minnows and small jigs are the best baits. Flannagan also offers good bluegill fishing. Nice ‘gills are often caught out of submerged trees by anglers targeting crappie during the early spring. Spawning bluegills congregate in the backs of coves and on shallow flats in the river arms during May. After spawning is complete, bluegills move to deeper water. Successful anglers find bluegills 10 to 15 feet deep along rocky shorelines and bluffs during the summer months. Jigs and small lures can be effective, but most anglers fish live bait in the form of worms or crickets. Both channel catfish and flathead catfish are present in the lake. Good numbers of “eating size” channels are caught each year, with an occasional trophy landed. Channel cats are caught on live bait, cut bait, chicken livers and artificial lures. Trolling for channel cats at Flannagan is increasing in popularity. Some huge flatheads are waiting for anglers at Flannagan. Fish to 40 pounds have been landed. The abundance of rocky banks and steep bluffs provide excellent habitat for this species. Carp are an under-utilized resource at Flannagan Reservoir. Some enormous carp swim in these clear waters. Some anglers have a chance encounter with these hard fighting fish while fishing for other species, but few anglers target the carp. There is a 12-inch minimum size limit on black bass in Flannagan Reservoir. Anglers can only keep largemouth and smallmouth bass that are longer than 12 inches. Anglers can keep five bass per day. There is a 20-inch minimum size limit on hybrid striped bass in Flannagan Reservoir. All hybrid striped bass less than 20 inches long must be released unharmed. Anglers can keep four hybrids per day. There is an 18-inch minimum size limit on walleye in Flannagan Reservoir. All walleye less than 18 inches must be released. Anglers can keep five walleye per day. There is a 10-inch minimum size limit on crappie in Flannagan Reservoir. All crappie less than 10 inches long must be released. Anglers can keep 25 crappie per day. There is no size limit for sunfish (bluegill, redear, etc.) in Flannagan Reservoir. Anglers can keep 50 sunfish per day. There is no minimum size limit for channel or flathead catfish in Flannagan Reservoir. Anglers can keep 20 channel catfish and 20 flathead catfish per day. There is a 30-inch minimum size limit on muskies in Flannagan Reservoir. Anglers can keep two muskies per day. There are five boat launch ramps at Flannagan Reservoir. Three of the ramps require a fee for launching (Junction, Lower Twin and Pound River). The other two ramps (Cranesnest and Spillway) do not require a launch fee. Located near the confluence of the Pound and Cranesnest Rivers, off of Route 615. The Junction ramp is adjacent to the marina, and offers boat access year-round. There are universally accessible boat launch facilities to assist boaters with special needs. Restrooms are provided. Located near the Lower Twin Campground. The Lower Twin ramp offers access only when the reservoir is at summer pool elevation (1396 feet). Located near the Pound River Campground. This ramp offers access only when the reservoir is at summer pool elevation (1396 feet). Located on the Cranesnest River arm of the reservoir. This ramp offers boat access only when the reservoir is at summer pool elevation (1396 feet). Located near the dam, this ramp provides access to the lower end of the reservoir. This ramp offers boat access only when the reservoir is at summer pool elevation (1396 feet). The marina is located near the confluence of the Pound and Cranesnest River arms. The marina offers gasoline and oil, snack and drinks, live bait and fishing tackle. A pontoon boat is available for rental. The marina also provides up-to-date fishing reports. You can contact the Marina at (540) 835-8408. There are two universally accessible fishing piers: one is adjacent to the boat ramp in the Cranesnest River arm of the Lake and the new pier at the spillway launch ramp area. Three campgrounds are available. The Lower Twin Campground and the Cranesnest Campground have a variety of amenities including electrical hookups. The Pound River Campground has restrooms and drinking water. Contact the Army Corps of Engineers at (276) 835-9544 for site reservations and fee schedules. You can also get more information about recreational facilities at Flannagan Reservoir by visiting the Army Corps of Engineers’ Web site. Biologists with the Virginia Department of Game & Inland Fisheries will soon be conducting a tagging study on Flannagan Reservoir to determine the level of catch and harvest on the walleye and saugeye fisheries in the lake. Beginning in February biologists will be collecting fish from the lake and tagging them with a 3-inch plastic “spaghetti” tag before releasing them back into the lake. Anglers are asked to report any tagged walleye or saugeye they catch by removing the tag and mailing it to VDGIF’s Marion Office to receive a $20 reward. Each tag will be printed with the words “$20 Reward VDGIF” along with a unique, three digit number and the address for the Marion Office. Tags will be located near the dorsal fin along the fish’s back and can be removed by cutting through the monofilament attachment with scissors or a knife. The fish may then be released or harvested, but anglers should remember that the 18-inch minimum length limit will still apply for harvest. Although the tags are brightly colored, they may become covered with algae over time so anglers should look closely at any walleye or saugeye they catch. Tags and basic catch information can be returned directly to the address printed on the tag or by using pre-printed, postage-paid envelopes available at the U.S. Army Corps of Engineers Flannagan Office, Flannagan Marina, or the VDGIF angler survey clerk that will be interviewing anglers at public access sites on the lake. Requested catch information includes tag number, the date of catch, general location of catch, and whether the fish was harvested or released. Please note that the actual tag must be returned to VDGIF in order to receive the reward. A small percentage of fish will be tagged with two tags, and anglers catching a double-tagged fish can receive the reward for each tag. For more information on this study please contact Jeff Williams at (276) 783-4860. Members of the Dickenson County Bass Club and Department biologists recently planted trees at several locations in Flannagan Reservoir (see photo in photo gallery). The trees were planted in areas that will be one to three feet deep when the lake reaches summer pool elevation. Black willow and bald cypress seedlings were planted. These tree species were selected because they will survive being submerged for much of the year. Trees planted in shallow water will provide spawning habitat for crappie, escape cover for juvenile fish and forage fish, and ambush locations for sport fish. Biologist’s hope to partner with the Dickenson County Bass Club and the U.S. Army Corps of Engineers to plant more trees in key locations in the future. Construction is complete on the new fishing pier at the spillway launch ramp. Pier construction was a cooperative effort of the Sport Fish Restoration Program, the Virginia Department of Game and Inland Fisheries, the U.S. Army Corps of Engineers and the Dickenson County Board of Supervisors. The pier measures 8 feet wide and 60 feet long. A hard-surfaced access trail leads from the parking area to the pier. Anglers can fish both shallow shoreline areas and deep water from the pier. Other wildlife enthusiasts can also enjoy the sights and sounds of the lake ecosystem from the comfort of a stable pier. Based on the success of walleye stockings completed since 2000, the Department will continue to stock 114,000 fingerlings into Flannagan each year. Sampling catch rates increased from an average of 5 fish per hour prior to the 2000 stocking to average of 12 fish per hour. The 2004 sample yielded the highest catch rate on record for Flannagan at just less than 20 walleyes per hour of electrofishing.